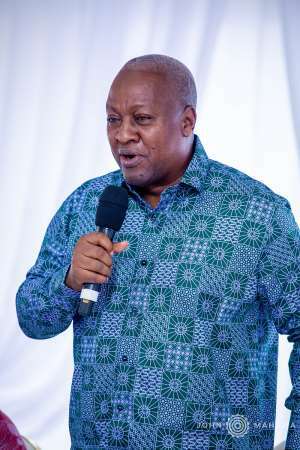 Former President John Mahama will today Thursday, April 4, be the guest of honour for a public lecture to review the economy before, during and after the International Monetary Fund (IMF) programme. The lecture, which will take place at the Mensvic Hotel at East Legon in Accra, is to be addressed by the NDC Member of Parliament for Bolgatanta Central constituency and financial analyst, Mr Isaac Adongo. It will be under the theme 'Ghana's rising fiscal risks, financial crunch and external vulnerabilities: A post-mortem of the Extended Credit Facility (ECF) Programme and a preview of the economy without the International Monetary Fund (IMF),' a statement on the programme copied to Graphic Online, said. The statement said the lecture would be organised by Coalition For Restoration (CFR), a pressure group affiliated to the National Democratic Congress. It is to be chaired by Mrs Betty Mould Iddrisu, former Attorney General and Minister of Justice, with the former president as guest of honour. “It is our conviction that the interest of the Ghanaian taxpayer will be better served if the untold and hidden facts about our economy are also brought to the fore for critical evaluation alongside what government wants people to hear. “We use this opportunity to invite all persons with the economy at heart to come and listen to the erudite Hon Isaac Adongo place the economy under surgical hands,” the statement said.